Ready Set Go is the name of this playful commercial playground structure, and it can entertain as many as 30 children aged 2 to 12 years with any of its 8 unique educational and recreational activities. 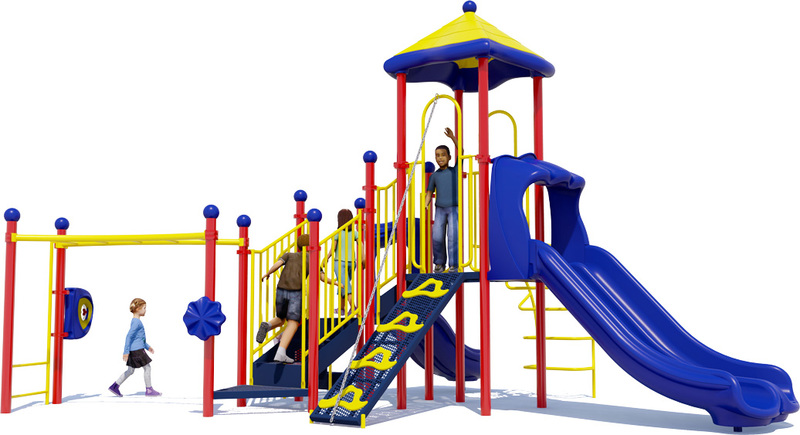 The Ready Set Go play structure provides an Inclined Wall Climber that offers children an opportunity to experience some of the excitement of wall climbing with a modified incline, to make it easier for children of all abilities. The Hand Peddler is an excellent fitness activity for children, but particularly for children who have special mobility needs, and it is accessible from the ground level. 8 engaging and educational activities for up to 30 children aged 2-12 years. A Double Velocity Slide and Single Speedway Slide for high speed (but safe) fun. An Inclined Wall Climber for simulated rock wall climbing. 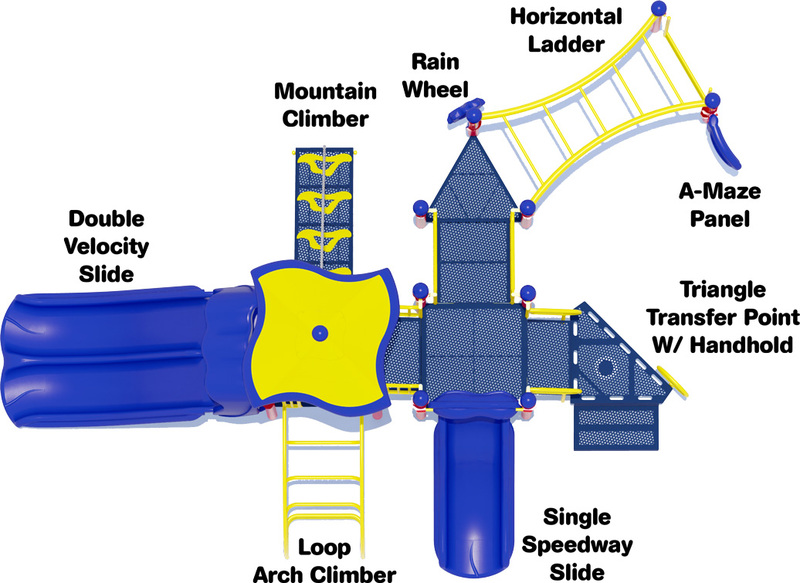 A challenging Loop Arch Climber to help children access the upper deck. A Rain Wheel for imaginative independent or group play. The structure is constructed from lead-free polyethylene coated punched steel decks, 3.5"O.D. galvanized 12 gauge upright posts, UV stabilized rotationally molded plastic components, and high-density polyethylene activity panels. Upright posts are powder-coated to customer color specifications, and are backed by a Lifetime Limited Warranty. All plastic components and decks come with a 15 year limited warranty. The metal pipes, rungs, loops, and rails associated with climbers come backed by a 50 year limited warranty. The structure is ADA accessible, and meets or exceeds all requirements from the American Society for Testing and Material (ASTM) and Consumer Product Safety Commission (CPSC). 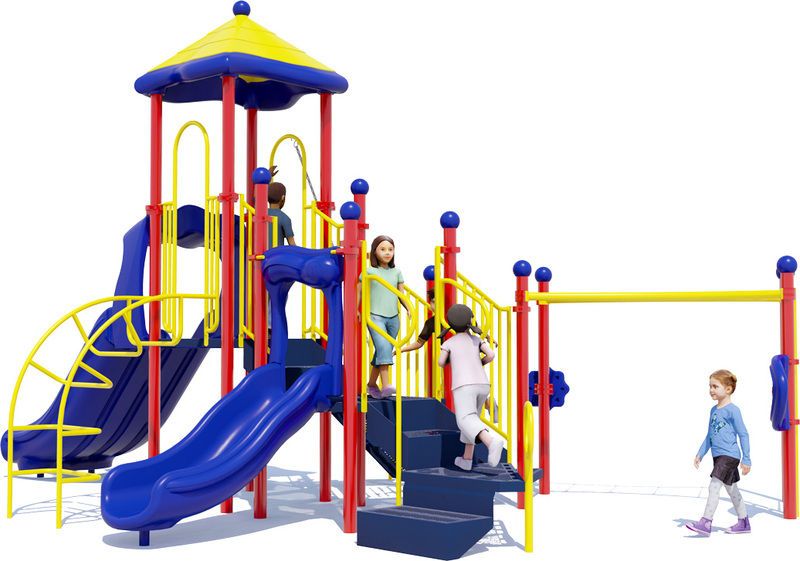 Choose from two standard color options in bright primary colors, or natural tones, or ask about customizing with your own unique color scheme to match your school colors, existing building, or other park equipment. 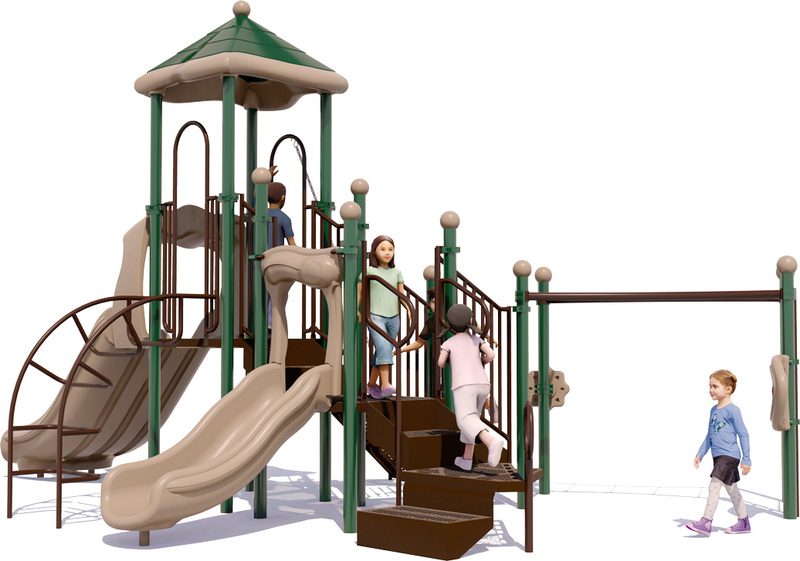 For additional safety we recommend our quality playground surfacing which comes in a variety of options including engineered wood fiber, or recycled rubber mulch. 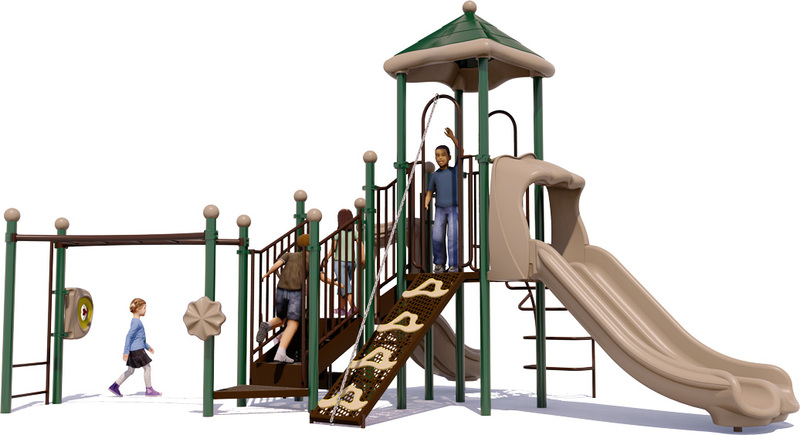 American Parks Company is a leading provider of quality commercial playground equipment, park and playground furnishings and much more. 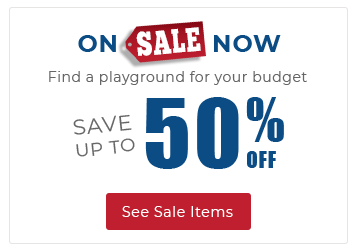 We offer an industry leading warranty on all our products, and our playground experts can help you design a park that suits your community and your budget. Call us at: 1-800-381-4491. 1 Double Slide, 1 Single Slide, 1 Wall Climber, And More!